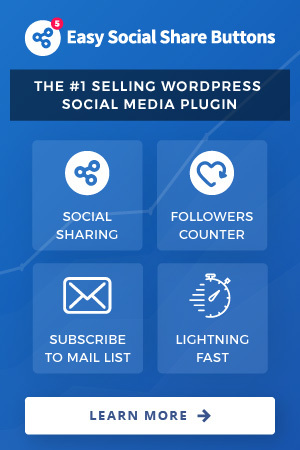 Inside Easy Social Share Buttons for WordPress you have several locations you can setup social networks – global for site, for a selected position, post type, mobile device, plugin integration. All those settings are loaded in provided order. For example if you setup a specific list for entire site inside global settings and choose a different list for the top content position you will always see the top content position share buttons. That option is made to provide a maximum flexibility when setting up the share buttons on site. The global share buttons are those that will always appear if you do not have a personalized settings. Those buttons you can set in Social Sharing -> Networks. Inside the global list of social networks you will also see when a position based settings are running. In the list of positions you have a checkbox option that will make if active also an update to the position networks settings. Here you can also set the social networks order that will be used on entire site for any position. The default mode is the user provided order but you can also change to be based on number of shares. As we mention above Easy Social Share Buttons for WordPress has an option to setup custom network list that will be used on site for a selected position. To do such change you need to visit Where to Display -> Position Settings -> <Position You Wish To Personalize>. To make possible selection of networks you need to activate at first that you wish to have a personalized position settings. When position settings are set to Yes you can choose a separate network list just below the style setup. To setup social networks that will appear when a mobile device is used you can use the setup inside Where to Display -> Mobile. Inside the mobile options you can choose social networks that will appear as global on site when a mobile device is used. There are also specific mobile position settings that also can be used to personalize just the mobile specific methods. Note. The mobile setup networks will not overwrite position based settings you may have set. If the site has a specific top position share buttons for the top location you will not see the buttons selected here. The setup of social networks for post type is very rear used but it is available as option inside plugin. The setup is pretty much the same like setting up social networks for position. The only difference is that options you need are located in Advanced Settings -> Settings by Post Type. Important Note! The post type and plugin integration settings has the higher priority. If you decide to use those settings they will always appear on the select post type and on any position – no matter of what you have made as custom location setup. The additional network options are available for a few networks. With those additional options you can control a specific function of the selected network. Those options are located in Social Sharing -> Networks -> Additional Network Options. Twitter: for Twitter you can set the default username that will be included automatically in the Tweet as via, default hashtags. You can also set to convert post tags as hashtags and activate Tweet optimization if you have a long titles of posts.